I got hooked on making my own bread after visiting my aunt who makes award winning sourdough loaves. She donated me a small sample of her starter dough, which I brought home and cultured until it had grown to a decent enough size for me to begin making my own crunchy, tangy loaves. Although this is not a sourdough recipe, I feel obliged to mention my aunt as it was the impressive texture and flavour of her sourdough bread that convinced me to start making my own every day. All the best bread begins with a starter. This is either a sourdough starter (levain), or a poolish, which is a 50-50 mixture of flour and water with a small amount of yeast that’s left for about 1 day to ferment before adding more flour, yeast and water to create the actual dough. Using a starter will create a superior texture and give the bread more depth of flavour. A mature sourdough starter will give you more flavour and texture, but fact that the poolish only requires 1 day of planning (compared to 1 week or more with the sourdough) makes it an attractive option. The basis of this recipe is similar to that found in Thomas Keller’s Bouchon Bakery. I have simplified the method to make it a little less labour intensive. It’s a compromise; the outcome of Keller’s recipe is slightly superior, although not by much! This recipe is quicker and easier, and pretty-much-as-good as Keller’s. It’s still quite a bit of effort for a loaf of bread, but trust me, it’s worth it. I have added bacon and comté cheese, along with some rich tasting rapeseed oil; this is a luxurious treat. The vital crunchy crust is achieved firstly by having a really hot oven before you put the bread in; secondly by scoring the bread, either down the center, across in stripes or a random pattern, with a sharp knife just before putting in the oven; and lastly by throwing a mugful of water into the bottom of the oven just before you close the door. For the final shaping and proving of the bread, you’ll need a baker’s linen cloth, or you can simply use a heavy-ish tea-towel instead. Also, a wide, flat baking sheet or stone is needed. Make the poolish; mix 125g of flour, 125g of water and ⅛ tsp yeast in a bowl until thoroughly mixed. Cover lightly with cling film and leave for 24 hours. When it’s ready, it’s surface will be completely covered in tiny bubbles. Mix the rest of the flour, yeast and salt in a bowl then make a well in the center. Add the water, rapeseed oil and starter and thoroughly mix to form a wet, sticky dough. Turn out onto a floured surface and pat into a flat rectangle. Stretch out the right-hand two corners as far as they will go and fold back into the center. Repeat with the opposite two corners, then turn over the dough, pat into a rectangle again and repeat. Repeat this whole procedure 3 times, then place back in the bowl, cover and leave for 1 hour. Stretch and fold the dough again. Cover and leave for another 1 hour. Fry the bacon over a medium heat until cooked, and only lightly coloured. Leave to cool, then cut into approx 3mm squares. Cut the comté into 3mm cubes. Divide the dough into 2 balls and split the bacon and comté into 2 equal portions. 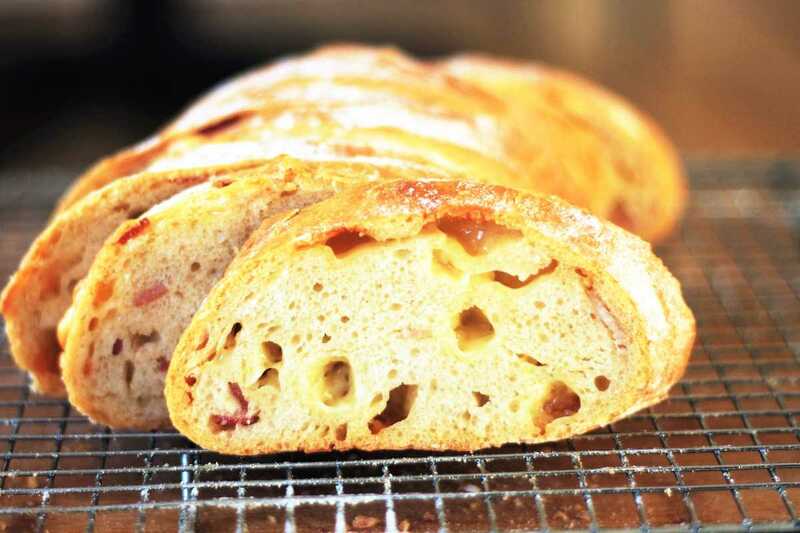 Knead the bacon and comté into the dough ensuring that it’s evenly distributed. Cover and leave for 20 minutes. Roll each into a baguette shape about 10 inches in length and 2.5 inches in diameter. Flour your cloth and place the loaves in, creating some folds to allow baguettes to keep their shape. Weigh the edges of the cloth down and cover with cling film. Leave for 1 hour or until doubled in size. Meanwhile heat oven to 210C and get your baking tray nice and hot. Transfer the baguettes one at a time to the hot tray, score with a sharp knife and place in oven. Throw a mugful of boiling water in the bottom to generate the steam required to get your crunchy crust. Bake for 25-30 mins until golden brown, and feel lighter than they look when you pick them up. Cool on a wire rack.